If you thought the Madden v Midland decision was a future risk for marketplace lenders alone, think again. According to a joint study by law professors from Stanford, Columbia and Fordham, one group is already suffering as a result of the decision, people with lower FICO scores. Since the Second Circuit’s decision only affected borrowers in New York, Vermont and Connecticut, researchers were able to monitor behavioral changes there against other states. They used data from three of the nation’s top marketplace lenders. In the Second Circuit’s jurisdiction, approved borrowers showed a significant increase in annual incomes, years of employment and FICO scores compared to other districts. Specifically, growth was concentrated among borrowers with FICO scores over 700. Approvals for borrowers with scores below 644 “virtually disappeared” while literally zero loans were issued to borrowers with FICO scores below 625. “Madden’s effect on loan volume grows as the borrower’s FICO score falls,” the data reveals. But even though lenders became afraid of the usurious implications in these states, borrowers did not take the Madden decision as a signal to stop payment. “[We] are unable to find any evidence of strategic delinquencies,” researchers concluded after a series of tests. 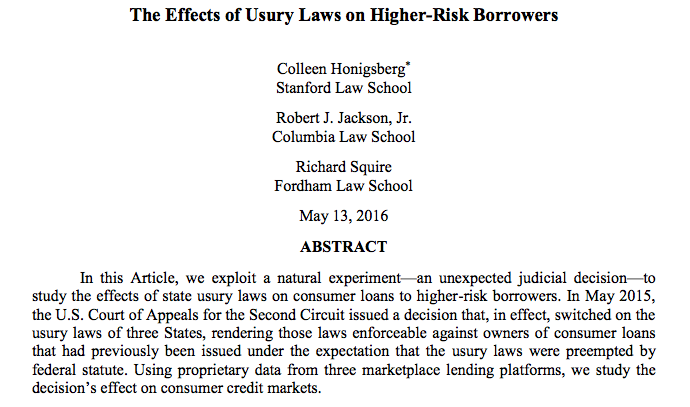 We find, consistent with basic economic theory, that the sudden enforceability of usury laws had the greatest impact on higher-risk borrowers. In a market where consumer loans are generally increasing in volume, the Madden decision disproportionately affected loan volume for borrowers with the lowest FICO scores.